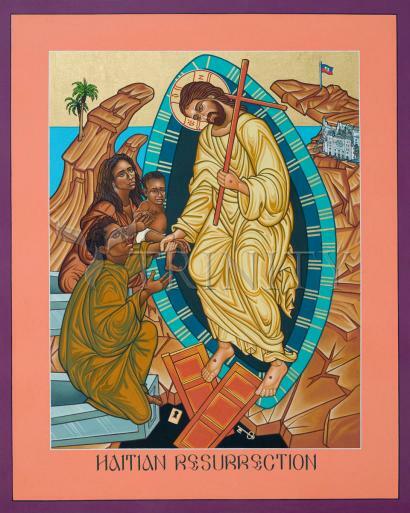 This icon is dedicated to the people of Haiti in remembrance of the more than 300,000 souls that lost their lives in the 7.0 earthquake of Jan. 12, 2010. Inspiration led me to memorialize the tragedy through the hope fulfilled in the traditional icon of the Resurrection, also known as the Descent into Hades. May we never forget. The original image actually honors the events of Holy Saturday, which leads to the Easter Resurrection. The emphasis is on the first act after the crucifixion where death is destroyed, opening to all the gift of life. The hardware of the gates is shattered; the door forever unlocked. Christ’s gown is illumined, evidence he illumines the way. The almond-shaped blue mandorla represents an opening between realms that Christ, gown aglow, leads us through. In the original, the two figures are Adam and Eve, first man and woman, led from their tombs. In this they represent every man and woman, and with their child, the beauty of family that was lost and redeemed. The flag and the Cathedral of Haiti, Our Lady of the Assumption, are depicted as symbols of what needs rebuilt. The peaceful sea and fractured land remind us that this world is filled with dichotomies. How are we to make sense of it? Christ’s cross on his shoulder is the sign, a coincidence of opposites; death leads to life.